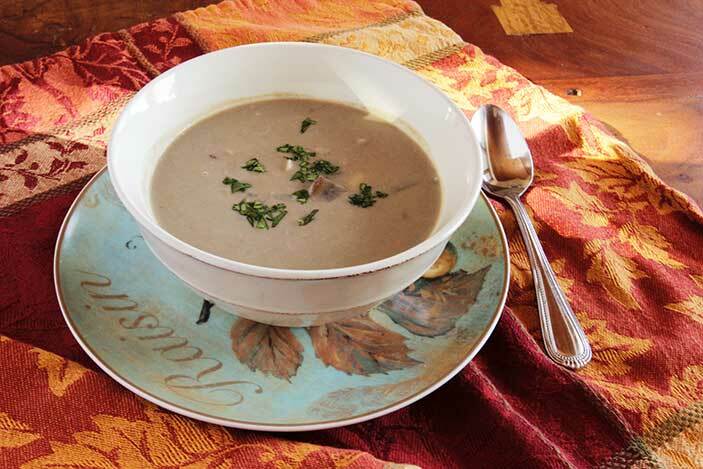 This sophisticated creamy Winter Immunity Mushroom soup is easy to make. It's contributed by Danielle Ryan, clinical herbalist and nutritionist whom I met at the yearly Colorado School of Clinical Herbalism fair, here in Boulder. It was so delicious that I had to have the recipe. Mushrooms are known for their medicinal qualities and they're a wonderful addition to a plant-based diet. A great source of B & D vitamins, they are also high in fiber and even protein. They also know to be a natural cancer fighter. 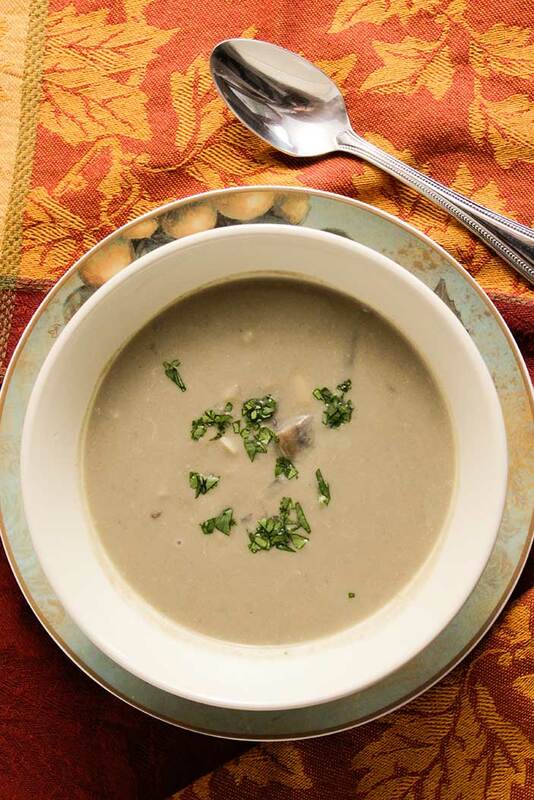 This cream of mushroom soup will taste better, and be better for you, than any you buy at the market. The creaminess comes from the coconut milk - not a drop of dairy. 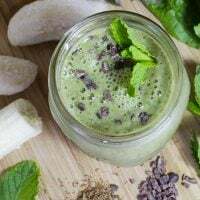 If you'd like less fat from the coconut milk, you can use 1 teaspoon of coconut extract instead mixed with 1 1/2 cups non-dairy milk. You will puree about half of the soup which also adds to the creaminess. You'll start by sauteeing the onions in a small amount of broth or water. When they have wilted, add the garlic and the mushroom, and continue to saute until they have reduced by about half. Then, you can add all of the vegetable broth, the coconut milk, and the drained white beans. This is a satisfying soup that's good for every day, as well as for guests. 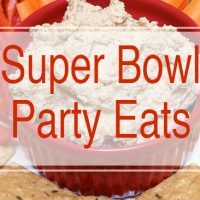 Serve with crunchy whole grain bread. 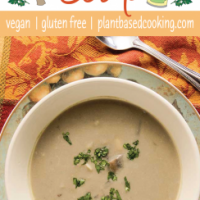 I'd love to hear your feedback in the comments below for this Winter Immunity Mushroom Soup! 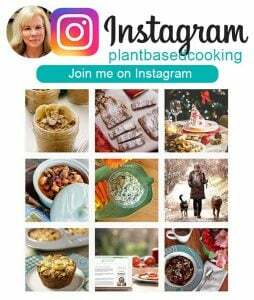 If you have a photo and post on Instagram, tag me using the hashtag #plantbasedcooking in your caption, and I won't miss it! 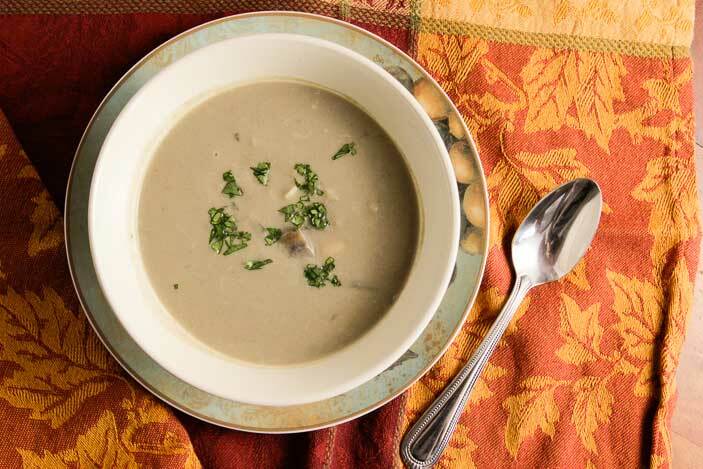 This creamy vegan mushroom soup is ready In 30 minutes. 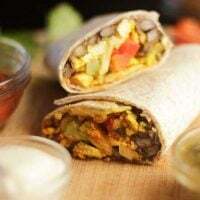 The addition of white beans helps you get your daily dose of beans. 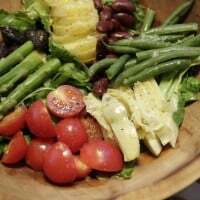 Serve with crusty bread for a filling meal. In a large pot, sauté the onions in water for about 10 minutes until the onions are just starting to caramelize. Add garlic and cook for about a minute until fragrant. Add the mushrooms and simmer for another 10-15 minutes, until mushrooms have about halved in size. Combine half the cooked mushroom and onion sauté, vegetable broth, and coconut milk in a blender on high speed for about 5 minutes or until creamy. At this point, add the medicinal mushroom powder if you're using. Pour the blended soup back into the pot. This creates a velvety soup broth, but still has some texture to it. Add the white beans and let simmer all together for another 5-10 minutes. Season to taste with plenty of freshly ground black pepper and sea salt if necessary. 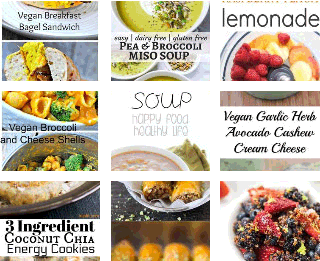 Ladle the hot soup into bowls and enjoy! 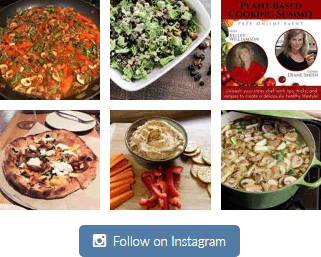 This post contains an affiliate link which, if you purchase, will help support plantbasedcooking.com without any extra cost to you. I made this for dinner tonight. I didn’t have coconut milk, so I used oat milk. It was still thinner near the end so I added a bit of whole wheat flour mixed with water. That worked. Both my husband and I like it a lot! He left his as is. I added pepper, fresh-dried sage, and rosemary, which turned out REALLY well! Now we have a new go to for soup! Thank you so much for sharing the recipe!!! So glad you enjoyed the soup! ???? I like how you substituted, too. It’s fun to hear how people make it their own. I’ll have to try those herbs next time I make this.